The I-Am that I am is not just in the background; the I-Am that I am is also in the foreground. The I-Am that I am in the background is in the form of Durga; the I-Am that I am in the foreground is in the form of Me, Kali. 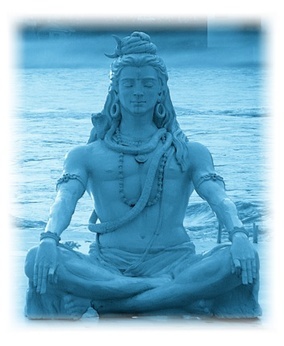 Together we serve Shiva, the Absolute. But know, O Wise Ones, that unlike Durga, the Kundalini, I have no interest in merging with the Absolute; I work independently. The I-Am that I am in the background in the form of Durga manifests beauty in this world. Golden sunshine, sparkling streams, flowering trees, majestic mountains are all part of My creation. But when I, as Kali, arrive in the foreground, the sun, streams, trees, and mountains may still remain, but their beauty fades and vanishes. The I-Am that I am in the background has always been given attention; the I-Am that I am in the foreground has always been ignored. That is why I, Kali, come for you with a flashing sword, eyes red in rage, face and breast stained with blood. Your cries of “Mother, Mother” cannot save you. Your Father, Shiva, the Absolute, cannot protect you. No one and no thing can rescue you. Know that for certain, O Children. The I-Am that I am in the foreground, I, Kali, am brutally fierce with any and all deep relationships you have established with anything, profane or sacred. Your misery, pain, and agony will show you I do not allow any trace of attachment or identification, lofty or lowly, to remain. To know the Absolute, you need the blessing of the I-Am that I am in the background, but to recognize even a glimmer of Consciousness, you need My blessing. Impure ones are obsessed with the world; pure ones are obsessed with the I-Am that I am in the background. But in the foreground, I, Kali, spare neither the impure nor the pure. The I-Am that I am in the background is available as peace, stillness, joy, and bliss. But this is all lost to you when I, Kali, arrive in the foreground. I bestow the blessing of the destruction of your pride; I will burn you in the flames of True Wisdom. One to burn the seeds of habitual tendencies and vasanas. One to dispel the results of past bad karmas. One to deliver suffering, humiliation, and disgrace. And finally as old age, prolonged illness, ignominy, and death in my third form. The I-Am that I am in the foreground, I, Kali, see no difference between Jnani or fool, saint or sinner, spiritual or worldly. When I come, all doors to the I-Am that I am in the background will be closed. O Proud Ones, remember that the I-Am that I am in the foreground, I, Kali, will destroy whatever pride and faith you have in Me as the I-Am that I am in the background. Indeed I am my own bane and adversary. The I-Am that I am in the background deludes Jnanis, Yogis, and Bhaktas to believe their ego is gone; the I-Am that I am in the foreground reveals the truth that the ego never leaves you until your skin is burned, bones are crushed, and heart is wrung like a piece of wet cloth. The last shred of ego is never destroyed by any practice, means, path, Guru, or God, but by Me alone. You cannot please Me through any penance, abidance, meditation, devotion, or good deeds. Nothing can soothe Me. Only the humiliation, disgrace, and helplessness that arrive by your defeat can satisfy Me. O seekers of Truth, know that this alone may calm Me and free you from My wrath. When tremendous pain and suffering, humiliation and disgrace come, know that it is not a time for seeking or accepting. Both will be impossible. Meet My arrival by surrendering and enduring all, and taking refuge only in My ferociousness and brutality. The I-Am that I am in the background can witness, accept, dissolve, and direct you towards the Absolute, but when I, Kali, arrive, none of that is possible. Know, O Wise Ones, that at that time, you are Mine. Some offer Me mantras. Some offer their breath. Some offer various other sacrifices. Yet the One who pleases Me most is the One whose eyes are ever-resting on My feet, and whose heart is one-pointedly devoted to My Lord Shiva, the Absolute. My dearest ones. Today is Guru Poornima — the day where we honor and worship our Gurus. So who is a Guru? In reality there is only ONE true Guru and he is always within us — in our hearts as our guiding light. Some call it the Self, some God, Christ-consciousness, Krishna-consciousness, Shiva, etc. But often we cannot hear its voice as we are in a trance completely besotted and infatuated due to the constant stimulation we derive through our connection with this world. That is why a physical Guru becomes important… whose only purpose is to speak the language of the inner Guru, help guide you to Him where eventually you become one with Him. Therefore a big part of worshiping and honoring your inner true guru (which is the very purpose of this auspicious day) is to first recognize a real physical Guru. Second by the level of responsibility he takes of your spiritual growth. In the message lies his wisdom, and in his responsibility for you lies his love and compassion. So lets first take what is the message of a true Guru. From the very beginning of Guru-Shisya tradition, the two messages given to every shisya is Abhyasa and Vairagya, which means Practice and Detachment. This was the constant message. The first message — Practice — means bringing the mind under control, constantly watching its movement and redirecting all energies to higher spiritual centres at the third eye and the heart. This is very important, as the long time habit of the life force is to feed the senses and derive temporary pleasure from them by the constant interaction with the objects. By virtue of intense practice a seeker reverses that habit and brings the life force to eventually sink into the very source of happiness and joy and meet the inner Guru. The second message — Detachment — means being in the world, but not of it. The root cause of all our suffering is due to the various identifications we inherit from this world. It is very easy to get caught up in this love affair of the world. Therefore, one must be very careful and constantly watch if passions for the world and for its objects arise in the mind and bring the mind within as per the instructions of your Guru. So Practice and Detachment are the two basic messages given by real Gurus. Now look around and you will find almost 90% of today’s so called teachers or Gurus never talk on that. In fact, they teach you just the opposite when they say nothing needs to be done, you are already free, there is nothing to attain and all you need is to be present — here and now. They are all therapists, but not Gurus. All they do is point to a certain “stillness” by a practice of recognizing an awareness independent of thought which they term as “what is” or “now” or the “present” but such a recognition has only a temporary effect as the ego finds its way to pull you right back again into the world once the effect wears off. It lacks the intensity and depth that a sadhaka needs to reverse the life force back into the SELF for it to stay there. So you see, the very foundation of such new age teaching (on which your entire spiritual journey rests) is compromised as these teachings ignore the two most basic instructions given by our sages and saints. Now we come to the second part of recognizing a true Guru. Which is about the level of responsibility he is committed to take for you. A real Guru takes complete responsibility of a seeker, which means he is committed along with the seeker in respect of time given and efforts put. This means he is forced to be selective. He carefully chooses his disciples and works with them very closely through his physical and subtle presence. Nowadays the modern Gurus who hold so many retreats aren’t even aware of the names of those who attend their satsangs, let alone the progress he or she is making on the path. The path is not as easy as it is made out today. It is not about embracing life or making it easier, comfortable or happier “here and now”. In reality the path with the Guru seems to do exactly the opposite, especially when one starts working with Guru. The Guru recognizes the egoic patterns based on habits and tendencies which want pleasure through stimulation of senses. The same ego then seeks momentary stillness by attending retreats and satsangs and finds some comfort in that. Hence many of the new age non-dual Satsangs today do nothing but feed the patterns of the ego by offering that comfort. They are, therefore, actually working against your real interest yet surprisingly they manage to thrive and grow exponentially because the majority of the seekers want to continue to indulge themselves with the pleasures of the world and are happy with the instantaneous ease and “spiritual” relief offered. It seems like a great deal earlier on, but a bummer later when 15 to 20 years have gone without any serious gains. On the contrary, a real Guru who works closely with his few chosen disciples, hits a disciple’s ego hard, repeatedly and relentlessly, till the disciple’s ego finally releases its hold and grip on his disciple. His method is not to induce comfort, but to bring you out of your comfort zone, to reverse the egoic pattern and ultimately to bring about its complete annihilation. Expiration (of ego), and not just inspiration, is the goal of a real Guru. Those who stay long enough, and can endure the work that a Guru puts on him, ultimately knows real freedom, real joy and real love which is not of this world. Such blissful realization is not fleeting nor changeable according to the circumstances he or she is in, the presence or absence of anything. It stays forever blissful in the midst of grave calamity, or even if this world had to collapse. So you see the real responsibility of a Guru is to remind you of your responsibility, which is a life long commitment to never forsake or abandon the true goal of acquiring a human body/mind, which is Self-Realization. 3) Unconditional surrender to the instructions of the Guru.